Arnica Montana flowers are grown organically in our own medicinal herb garden in the Beaver Valley and hand picked and infused in fractionated coconut oil. 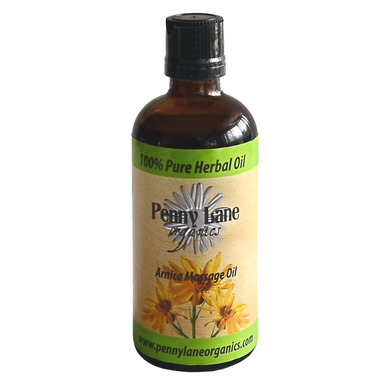 Heated gently by the warm sun rays oil absorbs healing properties of Arnica flowers. After 4 to 6 weeks flowers are removed, oil is filtered, poured into dark glass bottles and stored in a cold dark space. To keep this wonderful herbal oil fresh we add a drop of Rosemary extract. Directions: Use before and after physical activity by applying a small amount of oil over the stiff or sore muscle and gently massage until oil is absorbed completely. Ingredients: Organically grown Arnica Montana flowers from the Beaver Valley infused in fractionated coconut oil and with added Rosemary extract to keep the oil fresh longer. Warning: Do not use on open wounds or broken skin, during pregnancy or if breastfeeding or if you're allergic to any plants from a daisy family. This oil works really well on sore backs as well as bruises as long as there is no broken skin. I also add this oil in when making my pain relief lotion bars. very good product, not too greasy and works really well on tired muscles. very nice massage oil. Great for sore muscles and after the workouts. Will order again. very nice oil to use after workout. absorbs quickly and helps relax my muscles .